Back in 1980, in Ardeevin, Co. Clare 19-year old Dan Madigan told his family he was going to be a priest. His mother then took to bed, as she’d done in traumatic times before, and stayed there for many days. Mom has some problems and her children are affected in different ways. Hanna, the youngest child is the first focus chapter here. The above announcement and leave-taking are basically from her point of view, but there’s more to her story than that. The next section is in 1991, New York, and Dan is now about 30 and a closet gay in the height of the AIDS epidemic – he shows little of the compassion he might have had as a young priest, but we aren’t specifically told what happened to him. The book is divided into two parts – “Leaving” and “Coming Home 2005.” The former explores the experiences of the four children and their mother between 1980 and 2005. The latter is their thoughts and experiences during the holiday at home. In Part I each of the four children gets his own chapter and we get to know them as individuals – what they did after they left home. In Part II, 2005, the three who left the area return for Christmas with their now widowed mother and the one who stayed around and they each come to realizations about their own lives and relationships. 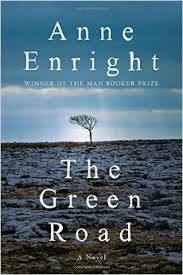 I read Enright’s The Gathering of a few years ago and wasn’t overwhelmed – I have a feeling neither I nor her books have changed much. I’m reading this for my own personal Booker Challenge which is to read as many of the 2015 Man Booker Long List as are available in the US/Kindle before the Short List is released. This way I can guess which ones will make the Short List – or win. My guess is that this might make the Short List, but there’s no winner here. This is very much a character driven novel with enormous attention given to developing the individuality of each. The pace doesn’t really pick up into anything until toward the end but the end is worth it.